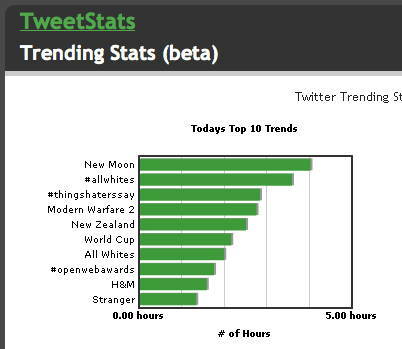 Let’s repeat that: Kiwis twittering on ‘allwhites’ hit the #2 trend for the day on twitter, worldwide. If you look further down the graph, there’s also ‘New Zealand’, ‘World Cup’ and ‘All Whites’. Great advertising for the country. As @Wordontheweb put it: #allwhites & twitter have introduced people to the concept of New Zealand tonight. Online marketing win! Absolutely. There seem to be a number of confused foreigners, though. A small number of people thought it had something to do with racism. You’d have to wonder what these people would say if the All Blacks trended on twitter! For any confused readers, the All Whites are our national football (soccer) team, who just beat Bahrain 1-0 to qualify for the main event of the Football World Cup to be held in South Africa in 2010. ‘Kiwis’ are us, New Zealanders. I’d be keen to see the $10 million that this earns from FIFA used to lift the local game. It’d make a great change from endless rugby.